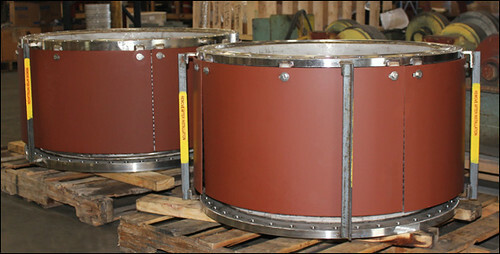 Twenty-four single hinged expansion joint were custom designed for a chemical plant. Eight are 16″ dia., four are 12″ dia., twelve are 6″ dia., and they range in length from 14″ to 16″. The bellows are fabricated from 304 stainless steel and the rest is carbon steel. The 16″ dia. joints are designed for 2° Angular movement at 300°F and 150 psig. The 12″ dia. joints are designed for 1 deg. Angular movement at 300°F and 400 psig. The 6″ dia. joints are designed for 1° angular movement at 300°F and 650 psig. 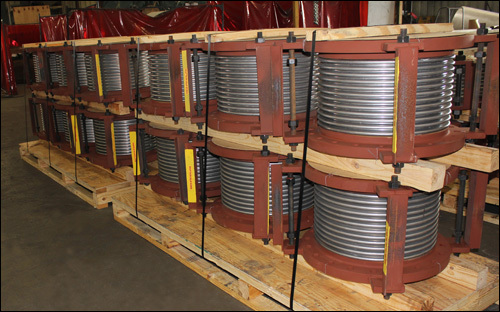 All expansion joints were dye penetrant examined and hydro-tested prior to shipment. 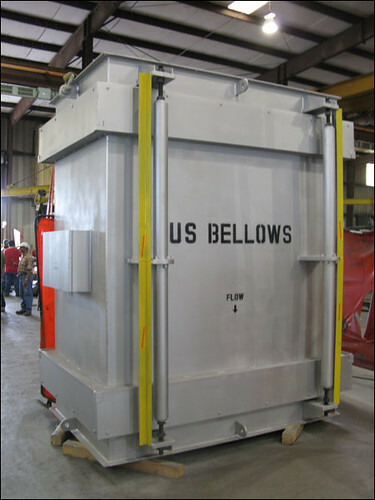 Within a two week deadline, U.S. Bellows refurbished a 59-1/4″ diameter single hinged expansion joint for a refinery in Louisiana. 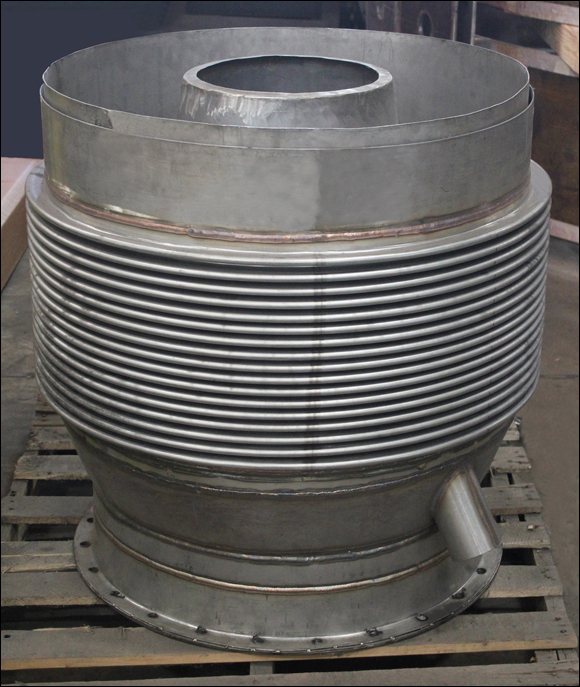 The expansion joint is 119-3/4″ in overall length and designed for .82″ angular rotation at 1380°F and 35 psig. 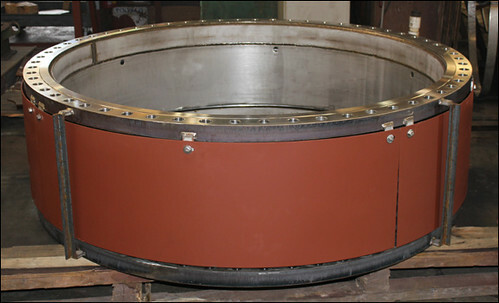 The bellows are fabricated from Inconel 625 LCF, and the entire assembly is 304H stainless steel. Before shipment, the bellows were x-rayed and the assembly was 100% dye penetrant and air tested to 52 psig. 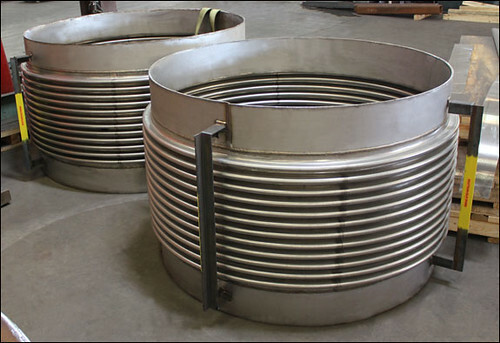 These single expansion joints are 20″ in overall length and range in diameter from 3″ to 56″. They are composed of 321 stainless steel bellows, 316L flanges and angles, and include carbon steel covers. The expansion joints were designed for 194°F at 22 PSIG and were dye penetrant examined and soap and air tested prior to shipping to Peru. This refractory lined expansion joint is composed of 321 stainless steel bellows and A588-A Corten angle flanges. It is lined with a 4″ thick refractory lining and measures 7′-2″ x 4′-6″ x 134″ F-F. The expansion joint was dye penetrant tested and will be utilized in flue gas service associated with a clean fuels project at an oil refinery. U.S. Bellows custom designed 14″ dia. and 84″ dia. 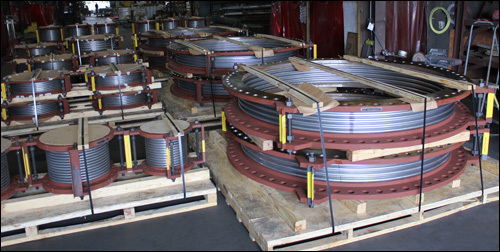 single expansion joints for a pipe line in an utility plant in Colorado. 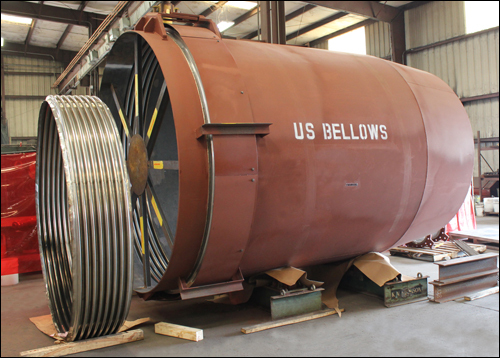 The bellows are 304 stainless steel and carbon steel was used for the flanges and tie rods. The assemblies were designed for a spring rate of 2,530 lb/in., 1″ axial movement at 300°F and 37 psig. The assemblies were dye penetrant examined and air tested with a delivery of 12 weeks. 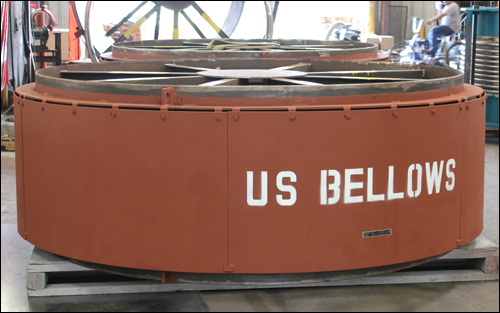 U.S. Bellows designed a 102″ dia. 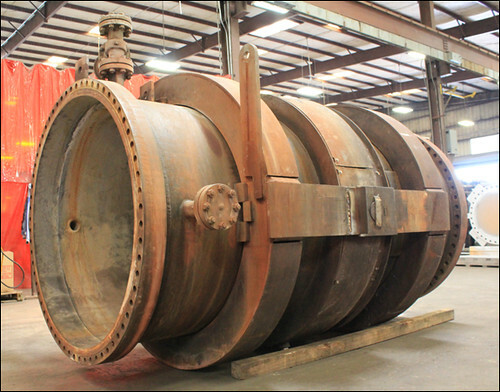 single hinged expansion joint and duct work assembly, along with two 92″ single expansion joints for a coal gasification facility in Mississippi. Both the assembly and expansion joints were fabricated from carbon steel with 304 stainless steel bellows, and designed for 3.6° angular movement at 825°F and 3 psig. The expansion joints were dye penetrant examined, 100% x-rayed and soap and air tested prior to shipment. 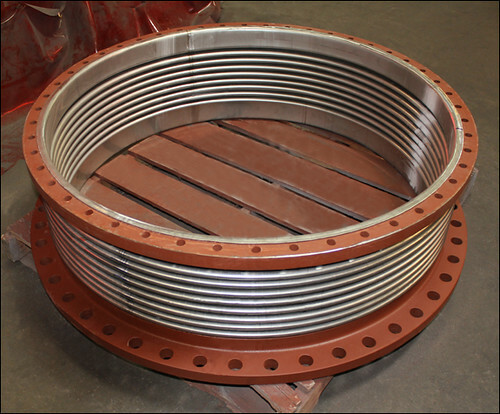 These single tied expansion joints are 40″ and 42″ diameter, and were designed for a solar electric generation facility. The bellows and flow liner are 304 stainless steel. The stub ends are fabricated from carbon steel. 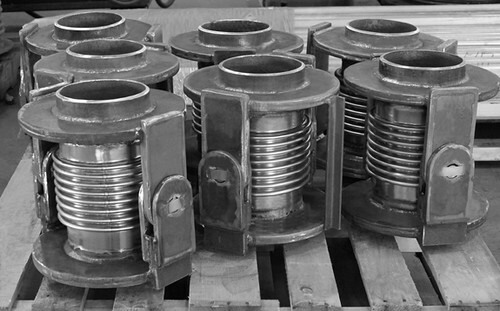 The expansion joints were designed for a lateral movement of 1/2″, and 15 PSIG at 250°F. They were 100% dye penetrant examined and hydro-tested prior to shipping to California.